As iOS 6 is making its way into the wild, iPhone users are getting their first taste of what the mobile OS's new Passbook feature can do, as Apple released the first volley of related apps for the NFC analog. Passbook is a new iOS 6 application that stores and takes the place of gift cards, loyalty cards, boarding passes and sports tickets. So if you need to keep track of your Germany-bound flight itinerary, or you don't know where to put all your cosmetics gift cards, Passbook has got you covered so far. The list is somewhat short compared with the number of company apps Apple showed off when it was selling Passbook to the public during media demonstrations. If Apple makes good on those demos we should expect to see Delta Airlines, American Airlines, United Airlines, Starbucks, Target, Amtrak, W Hotels and Apple's own retail store all join the roster of Passbook compatible apps. The list is also an early indication of how well Apple's Passbook will stand up against Near Field Communication, which Passbook was created to compete with. NFC is a short-ranged data swapping tech that allows users to share photos, use a digital wallet, or hold and replace loyalty cards and gift cards on their smartphone. Sound familiar? NFC is a technology that can do most of Passbook's tricks with the proper apps. The difference is NFC relies on devices communicating with each other where Passbook is mainly visual based and uses the display to allow vendors to scan data. NFC was on the wishlist of many technophiles when iPhone 5 speculation was rampant. When Apple unveiled the new smartphone without NFC many blasted the tech giant for the omission. Apple Senior VP Phil Schiller defended the decision to leave out NFC during the iPhone 5 event, saying that he doubted if NFC could really solve any current problems and Passbook can service the needs of today's customers. 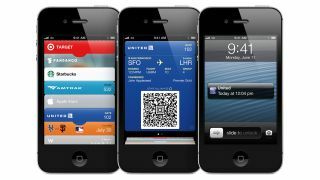 Whether or not Passbook can truly outshine NFC is only something time, the marketplace and Apple's App Store will tell.